Learn about a local lady who's channeling her passion for fashion through handcrafted pieces of wearable art, now available online and a pop-up shop soon coming to OTR. Although Dawn Grady’s passion for jewelry just sparked within the last decade, she’s been fanning the flames to create an empire out of her talents ever since. Today, she is the owner of Junebug Jewelry Designs, a jewelry business that she describes as Bohemian, eclectic, modern, funky, and earthy. Grady says that at Junebug, she likes to keep things original, creating only one-of-a-kind and limited-edition pieces. “This ensures that customers never see their unique accessories on anyone else,” she adds. The story behind Junebug starts with a bead stringing class at the University of Cincinnati. It’s where Grady made her first necklace and earring set. From then on, making jewelry became an obsession for Grady. Grady says the name for her business comes from her father, as he gave her the nickname “Junebug” when she was younger. She says the name “Junebug” represents a time in her life when she feels she was very creative, and is a level of creativity she taps into when designing her jewelry. Junebug officially launched in 2012, when Grady began primarily selling her jewelry online, at craft shows, and through her own pop-up shops. Each piece from Junebug is made by Grady’s own hands, and meets her high-quality design standards. 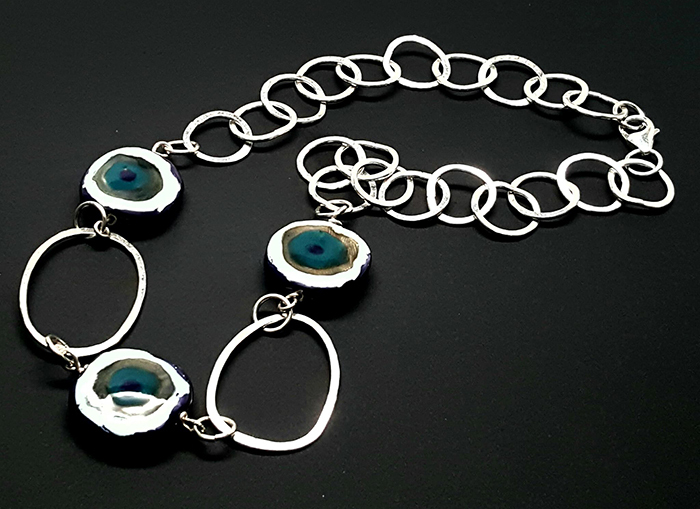 Junebug designs are mostly copper and Argentium silver statement jewelry. Grady says that she loves working with copper because of the unique way that it antiques, while Argentium silver is highly tarnish-resistant and stays brilliant without much effort. 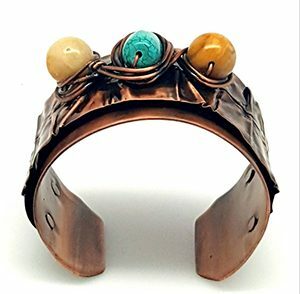 Grady says one of her favorite designs are the copper cuff bracelets. Grady says that one of her favorite parts about Junebug is challenge herself to create unique finishes on her jewelry. Whether it’s using a torch to create a fiery look or mustard to deliver shades of bronze and turquoise. Grady also enjoys using natural stones in her pieces, to incorporate their beauty and energies into the designs. “I created the Innerjee Collection of beaded gemstone designs that combine the stones to deliver specific energies,” says Grady. You’ll soon have a chance to see Grady’s designs in person. She will open her pop-up boutique, Fiyah & Glow, on February 10-12, 2017. The boutique is located at 1329 Vine Street in Over-the-Rhine, but Grady says you can also shop the designs any time online at www.junebugjewelrydesigns.com. 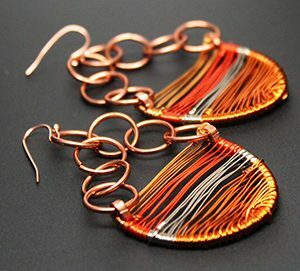 To learn more about Junebug, visit www.junebugjewelrydesigns.com. You can also follow Junebug on Facebook, Instagram, Twitter, and Pinterest.